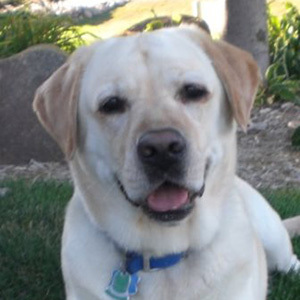 Cash is an English Labrador who has always brought smiles to everyone he meets. It was because of this simple fact that Sue decided Cash would be a perfect therapy dog. “Gentle” and “sweet” are two words people often use to describe Cash, and Sue says it’s heartwarming to see the joy he brings to so many people. Sue & Cash visit regularly as a North Star Therapy Animals team at Children’s Hospital in Minneapolis and Fairview Ridges Hospital. Cash is always eager to visit – especially when Sue tells him they are going to meet new friends! Cash has touched many lives with his visits but has formed some especially significant friendships in the Hematology/Oncology clinic at the Children’s Hospital, where the team has been visiting since 2013. Cash knows how to relax too! When he’s not visiting, Cash enjoys long walks, play time at the park, and rides on the golf cart.